Summer is here, and that just might mean summer camp for your children. Camp is a great way for your child to get away from home, meet new friends, and experience new adventures. However, summer camp is also a good time for your child to return home missing several of his personal belongings. Our clothing labels for kids are the perfect choice for labeling your child’s clothes before you send him on his way. Here are some other ways you can help ensure that your child has a great camp experience — and you don’t have to spend oodles of dollars replacing lost items. Label more than just his clothes. Label his luggage and other personal belongings. 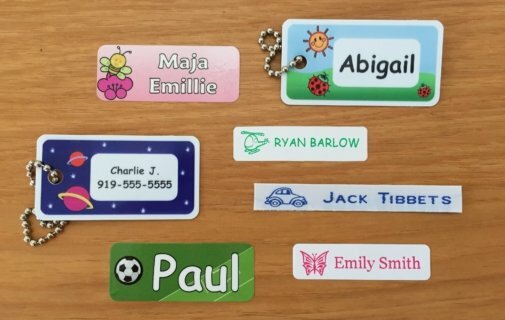 Here at It’s Mine Labels, we offer a wide selection of kids’ labels for all kinds of items. You can even add a mini-label to his toothbrush for hygienic reasons. Label everything that will hold a label, and everything should come right back home. Help your child pack. If you leave it up to him, everything is going to be stuffed into bags as quickly as possible. Help him by sorting everything into the proper compartments. This way, while he is at camp, he will be able to find things faster — which means he won’t be tossing everything out in search for an item. This can cause him to lose something he might need. When you pick your child up from camp, make a run-through of his sleeping quarters. Check under the beds and in other places where something might be left behind. If the forgotten item is labeled, you will have no trouble proving it belongs to your child. Contact us today at It’s Mine Labels for more labeling tips and to learn more about our wide selection of clothing labels.